With the explosion of cloud traffic growth, demands on enterprise networks are changing fast. Fortunately, we have a solution. 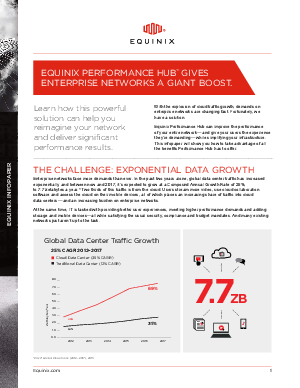 Equinix Performance Hub can improve the performance of your entire network — and give your users the experience they’re demanding — while simplifying your infrastructure. This infopaper will show you how to take advantage of all the benefits Performance Hub has to offer.